From the Hancock County Courthouse, go southwest on Hwy 22 for 7.2 miles to Devereux. Turn right (at the backwards fork) onto Main Street. 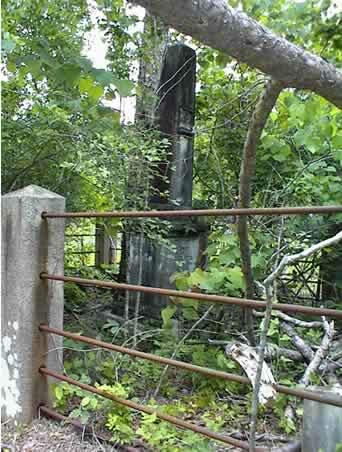 Go 0.2 mile to the dead end and turn left on Jones Chapel / Devereux Rd. Go approximately 2 miles to Powell Grove road on your right. Go 1.4 miles on Powell Grove Road to the end of the pavement and the intersection of Powell Grove, King Road and Sandy Run Rd. Go straight forward on Sandy Run Road and go 1.5 miles to where it splits. Turn left (which is still Sandy Run Road) and go 2.6 miles to a logging road on your right. Walk or drive 0.3 mile to a clearing (as of 2003) on the left. Turn left into the clearing and walk through the clearing into the woods for a total of 365 feet to the cemetery from the logging road. b. in Sussex Co., Virginia. d. Hancock Co., Ga. Age 84 yrs, 2 days. On same monument as Nancy Rives. b. Hanover Co., Virginia. d. Hancock Co., Ga. On same monument as George Rives. 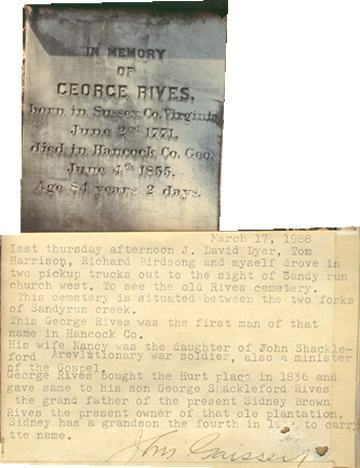 Note: Maiden name from Hancock History marriages: "Nancy Shackleford - George Rives - 1809". 6 years. Last name assumed. Only R appears on stone. 4 years. Last name assumed. Only R appears on stone. 6 months. Last name assumed. Only R appears on stone. First initial may be "C".